No Immediate Concern, published earlier this year, focuses primarily on nuclear power and the disaster at Fukushima; No Good Alternative journeys into the world coal, fracking, and oil. Readers are encouraged to peruse a discussion of No Immediate Concern here before proceeding. Although it’s important to remember that No Good Alternative is simply the second half of a single, larger work, it’s curious to compare the two volumes and evaluate how they are different. In the Fukushima chapters of No Immediate Danger, Vollmann explores irradiated towns and restructured power plants in an immersive, transportive feat of narrative journalism. 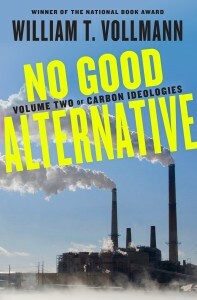 Conversely, his investigations into coal, fracking and oil are met with resistance and counterpoint; without access to facilities, the majority of No Good Alternative’s adventures are less intensive, but their closed doors color these energy sources with a personality that Vollmann would likely not have discovered on his own. 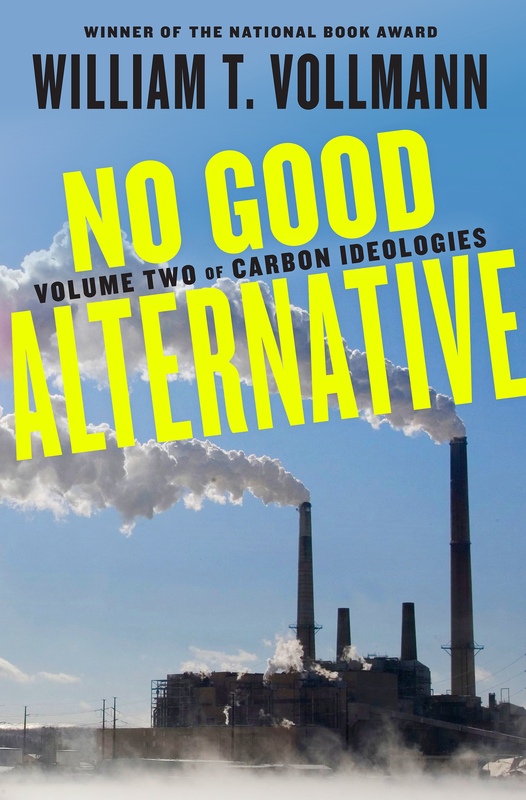 Throughout No Good Alternative, the majority of interviews end up being with vocal individuals in opposition to a particular energy’s rampant use; many of the pro-coal, pro-fracking, and pro-oil entities with whom Vollmann tried to engage declined to be a part of his discussion. He then travels to Bangladesh’s coal mines, a doomed world energy source ensnared by “foreign-based multi-national corporations.” Even after switching gears to fracking and natural gas, the “malignant chaos” that he saw in West Virginia prevails. Despite fracking being a relatively new energy source, Vollmann renders Greeley and Loveland in Colorado as regions on a West Virginia-like precipice, replacing local spirit and environmental health with acrid frack pads and all the searing chemical funk that accompanies such a rig. Vollmann closes Carbon Ideologies by focusing on oil. Following a fascinating preamble on gas and our cultural dependence on automobiles, he travels to the United Arab Emirates to interview the petroleum workers of Ruwais, an industrial city on the Gulf of Arabia. Although this section in the UAE spans only about a sixty pages, it is a highlight of this volume: Vollmann not only reveals the region’s relationship with energy production but also illuminates the labor camps and the international mesh of cultures that man the plants in Ruwais. At the end of Carbon Ideologies, Vollmann makes repeated attempts to explain “what we should have done.” He is humbled, and fully aware that he too is at fault for his liberal use of energies in the name of comfort. He finds no concrete solutions for our current crisis but reveals one prevailing constant through each of these energy sources: human nature. Greed, complacency, laziness, stubbornness — man’s shortcomings have managed to poison each of these already-dangerous energies into something far worse than anyone ever imagined. Throughout Carbon Ideologies, Vollmann presents climate change as not simply a problem but the result of a greater problem: the unknowable, dangerous thing that is humanity. Our self-serving ploys, and the low cunning of certain high executives, the apathetic greed of the horridly named ‘consumers’ and the cynical short-sightedness of those who served them, the nationalistic loyalties of irradiated Japanese and much-abused patriotic religiosity of West Virginians, the ignorant desperation of Bangladeshi activists, the unhealthy toil of guest workers in the Emirates and the gleeful stupidity of adversarial political systems under which a politician would squander a planet in order to distinguish himself from the incumbent, all these I have now presented to you, leaving (I suspect) a pervasive impression of our depravity. All this to keep the lights on.